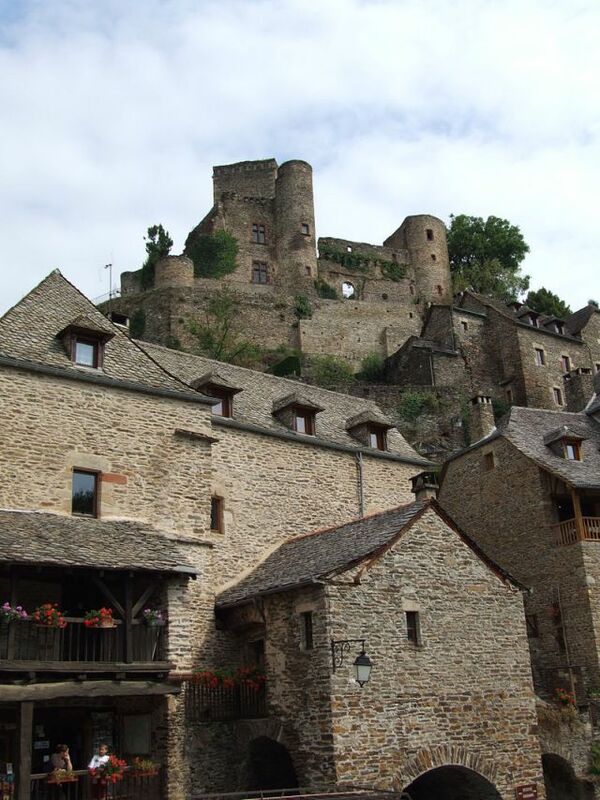 Location: Belcastel, in the Aveyron departement of France (Midi-Pyrenees Region). Notes: Château de Belcastel is a mediaeval building in Belcastel in the department of Aveyron, on the right bank of the river Aveyron, downstream from Rodez.This medieval castle (whose foundations date back to the ninth century) was attacked by the English during the Hundred Years War, but we think it was never conquered. Belcastel belonged to a family of the name of which branch survived until the seventeenth century. The feud was "acquired, in 1251, Raymond Belcastel by Count Hugh IV of Rodez, and given in 1385 by Jean III of Armagnac, Count of Rodez Guillaume II Saunhac" squire of the Count of Armagnac small son of Guilhaume of Saunhac, grand master of the Knights Templar. After belonging to the family Saunhac it happens in Morlhon family by marriage March 25, 1546 to Mary Saunhac Belcastel with John III Morlhon, Lord of Sanvensa and Castelmary, Seneschal of Quercy and Rouergue, then in that of Bush Bournazel by marriage February 5, 1592 their daughter Florette Morlhon with Francis I of Buisson, Marquis de Bournazel, governor and steward of Rouergue, which are not reside. At the time of the Revolution, the castle belongs to Claude Buisson, Marquis de Bournazel, last lord of Belcastel, died January 10, 1792 in Villefranche-de-Rouergue at the age of 91ans. The castle was no longer inhabited or maintained since at least the seventeenth century. The architect Fernand Pouillon (1912-1986) discovered in 1974 in a very advanced state of ruin, and began to restore it and the village. The path and alleys were also in very poor condition. "There is no passable road to the castle. I meet by foot on the steep banks of the Aveyron. (...) A detestable path patched, rambling, mended by here and there of riprap, Its restoration is exemplary in that it is impossible to determine which is the modern contribution to what was now a field of ruins (Pierre Lagarde in issuing Masterpieces in peril had said that want to restore the castle of Belcastel tantamount to "want to empty the sea with a teaspoon." Although he filed construction permits for all ruined houses of the village, he had time to fully restore that 'one above the castle (as adjusted by the current owners), but he also had consolidated most of the other ruins of the village, which were then bought by the town thanks to European funds to be restored and rented to the year. This imposing castle was home to the family Saunhac. It is since 2005 owned by two New York galleries. It is open to the public from early April until mid-November. He received in 2008, 15 000 visitors.